Hello friends, is spring slowly creeping into your part of world (unless you're in the southern hemisphere and then I guess you're heading into fall)? For all intents and purposes, we have had a mild winter here in the southeastern part of the U.S. That being said, it's always a good thing for one season to head out the door and a new one to be ushered in. I'm all about creating cozy in the fall and winter months, like my big chunky throw. However, I'm not keen about all those heavy blankets lying around my home in the spring and summer so I end up stashing them away for a couple of months. But there are times in the spring and early summer when I find myself needing some kind of throw to cover my legs, even in these warmer months. It's no secret that I have a penchant for linen, so when I spied this linen throw, I had no choice but to follow that call. And while I specifically made this as a throw to cover my legs on a cool spring or summer evening, I realized that this linen throw has many uses. 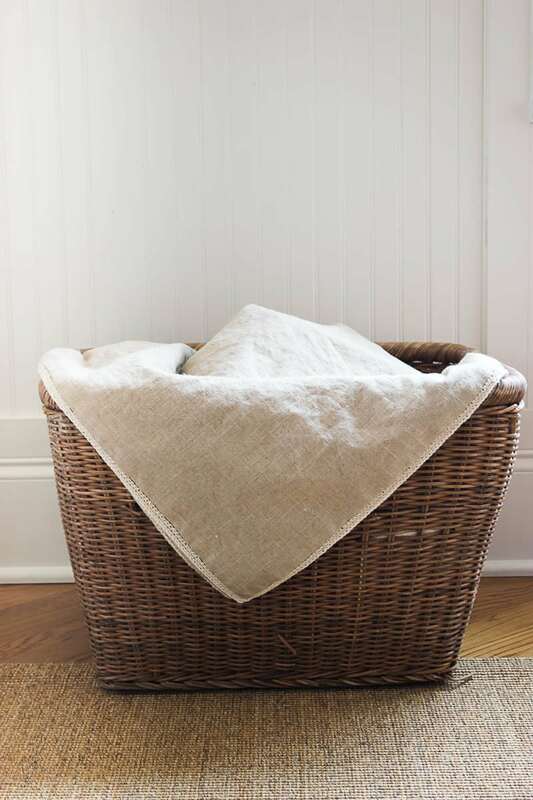 It is also a great throw for the foot of a bed during the spring and summer, especially if you want to swap out a heavier throw for a lighter linen throw during the warmer months. Need a quick table cloth for a card table? This is the perfect size! I opted to skip the fancy crochet edge and keep my linen throw very simple, so simple that someone who has never crocheted before can do this. Trust me. With a few practice passes of the simple single crochet stitch, you'll be ready to crochet this edge on your piece of linen to create your own linen throw. I've made a couple of videos to help if you need it. So let's talk about linen for a minute. Try to get a 100% linen fabric, which comes in a variety of colors. 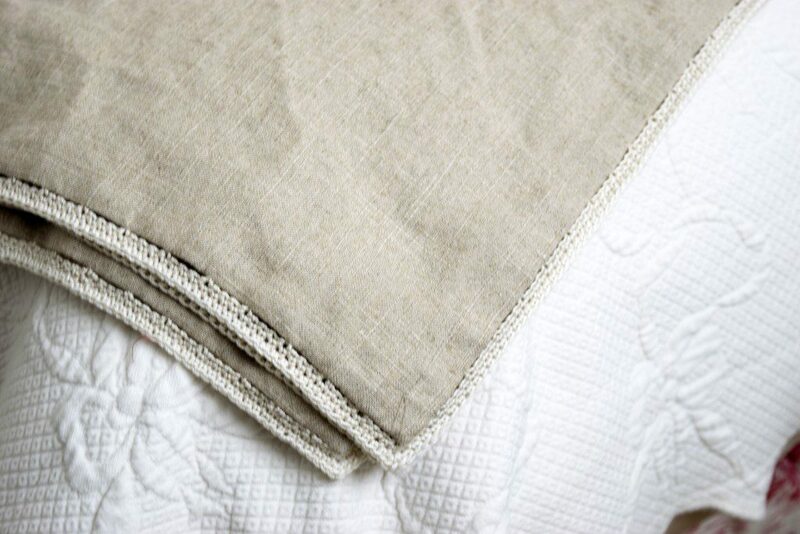 With the 100% linen, the fibers will react the same when washed. I was able to find 100% linen priced from $9.99 per yard up to $16.99 per yard. Linen in the desired length. I wanted a square, so since my fabric was 57″ wide, I bought 1 2/3 yard. Piece of cardstock with a line drawn across 1/4″ down from stop and another 1/2″ down from top. See below for illustration. You are going to want to wash your throw before you sew, but before you wash it, run a quick stitch with your sewing machine or you will have a unraveled, knotted mess! Iron down, using spray starch, 1/4″ on all sides and then iron down,using spray starch, 1/2″ on all sides. I found the easiest way to do this part is to have a a piece of cardstock marked at those increments that I could fold the fabric over and iron. Once you have 1/4″ turned over and ironed, and then 1/2″ turned over and ironed, it's time to make your mitred corners. Here is the link to a tutorial I did on mitred corners. Once your mitred corners are done, you may be inclined to sew the hem down. I found it best to wait on this. If you sew it down, all your knots from sewing the backstitch will show. If you've starched it well, the crease will remain while you sew in the backstitch and you can sew the hem afterwards. I made marks every 2 cm around the perimeter of the linen with the disappearing ink, threaded my needle with the pearl cotton and sewed the backstitch at the edge. If you aren’t familiar with the back stitch, it’s very simple. Come up from the back of your fabric and out point number 1. Then go in point number 2 and out point number 3. You will then go back in point number 1 and out point number 4. From point 4 you’ll go in at 3 and out at 5. Get it? 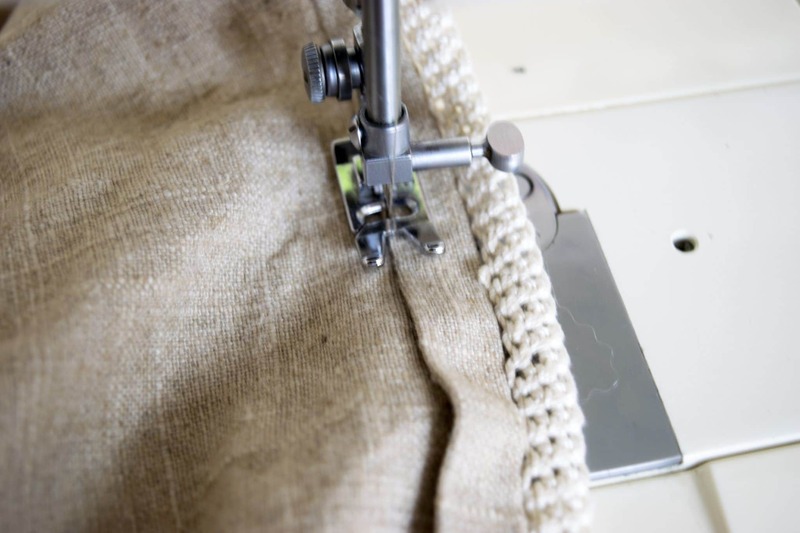 Once you've sewn the backstitch around the linen throw, you can get started with putting the crochet edge on. Work 4 single crochets into each back stitch segment. This youtube video will show you how to pick up four stitches within each backstitch segment. You'll repeat this for each backstitch segment all around your throw. At your corners, add two extra chain stitches as your turn the corner. In other words, when you get to the last segment before the corner, after you've done your 4th stitch, do two chains before you start the 1st single crochet in the first segment on the next side. Make sense? Once you've gone all the way around, putting 4 single crochets into each back stitch segment, You can start your extending your edge as wide as you'd like. I did 3 rows of single crochet to get the edge I have. In the video I mention the ‘little Vs. That's what the stitches look like from the top to me. In any event, you want to single crochet in every stitch, which you can tell by the V made on the previous row. When you get to each corner put 3 extra single crochet stitches in your corners, as shown in the next video. Do this at every corner, no matter how many rows you make your edge. Once you've added all the rows you want, tie off your crochet thread and weave it into the edging. To finish it, use your sewing machine to sew down the hem that you had ironed and starched earlier. 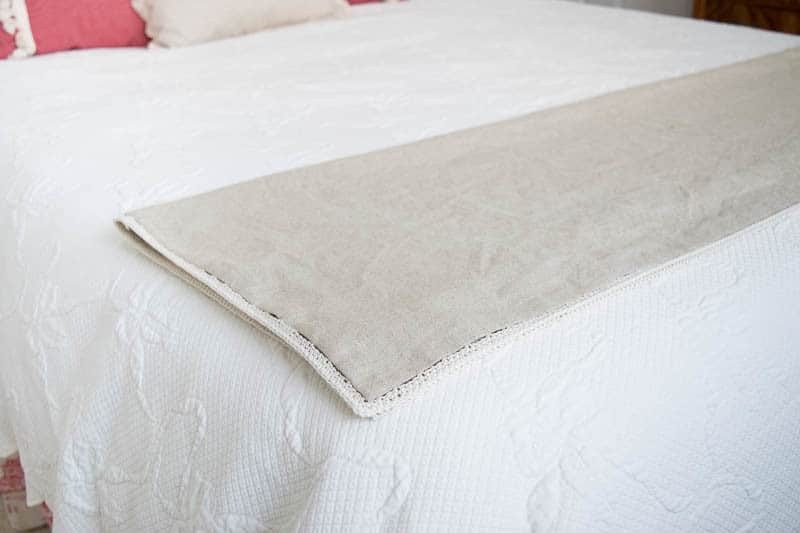 And that's all it takes to make your own linen throw with a crochet edge. I'm heading back to the fabric store this week to pick up a pretty green/blue linen to make one of these for my bed. 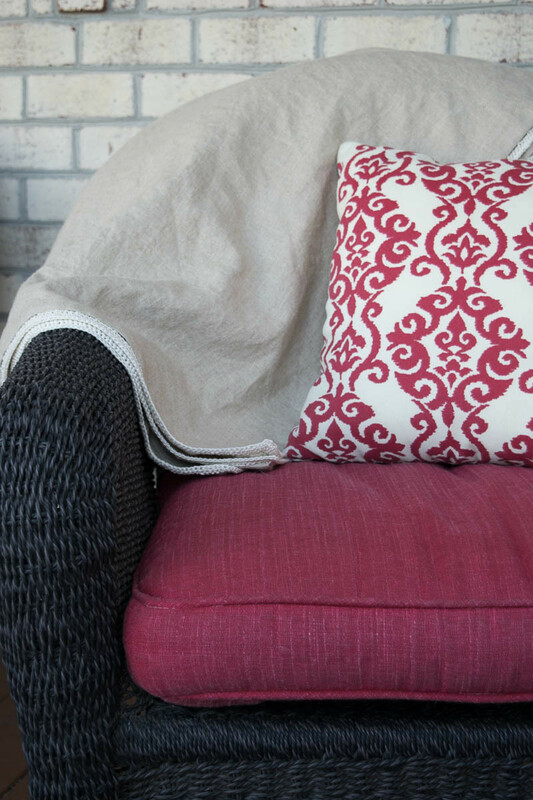 If you're looking to get a head start on Mother's Day or need a house warming gift,a linen throw would make a great option. Oh wow, Lynn, this is right my style! I love how simple, beautiful and warm it looks and I love the little crocheted detail you’ve given it, that’s the dot on the “i” as we would say in Germany…Linen is a great decorating tool, and I’d use it for all the spots you showed above, so I’d have to make a few! Your tutorial on how to crochet the edges is great, I should really get this going, because you’re right, I don’t want heavy throws around the house either…at least for the next half year or so! Have a great Wednesday friend! Hi Katrin…I really hope you make one for your home…I can so very easily see one fitting in so well with your decorating style. And it really was so very easy. Let me know if you do! Simply stunning! 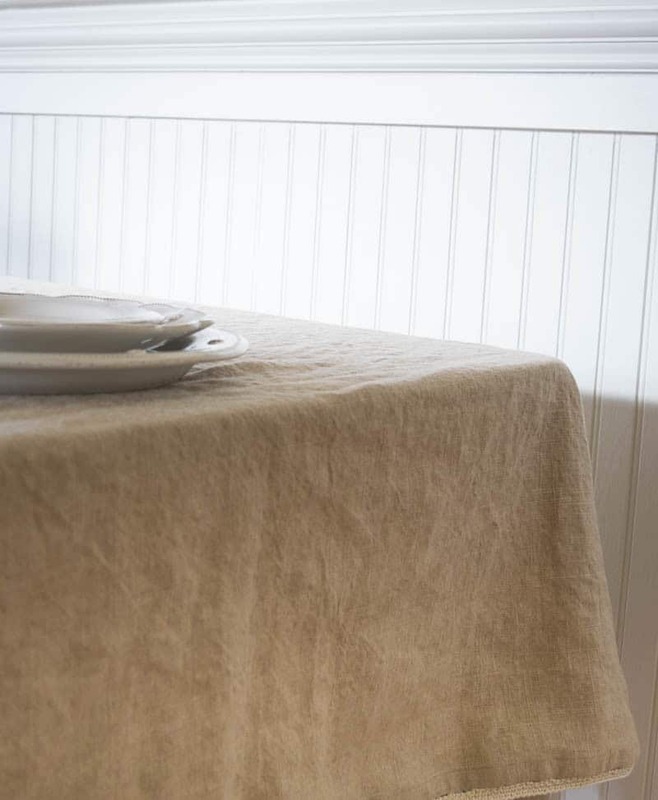 I love the understated elegance of this throw. And the fact that you made,it along with the border which is beyond beautiful, leaves me speechless. I too like pieces like this, simple yet oozing with elegance. The border is such a lovely touch. Thanks Mary for you oh so kind comments. I almost stopped by the fabric store today to pick up some blue/green linen for my bedroom, but I restrained myself…for the time being anyway. I’m thinking I’ll be making another one very soon. As always, thanks for swinging by today. I love this throw. 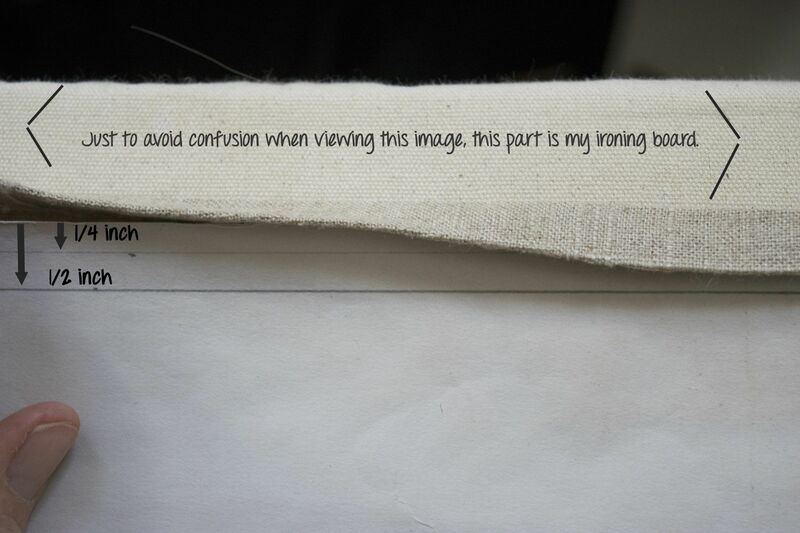 Thank you for including the wonderful instructions for stitching it. The linen is just beautiful! 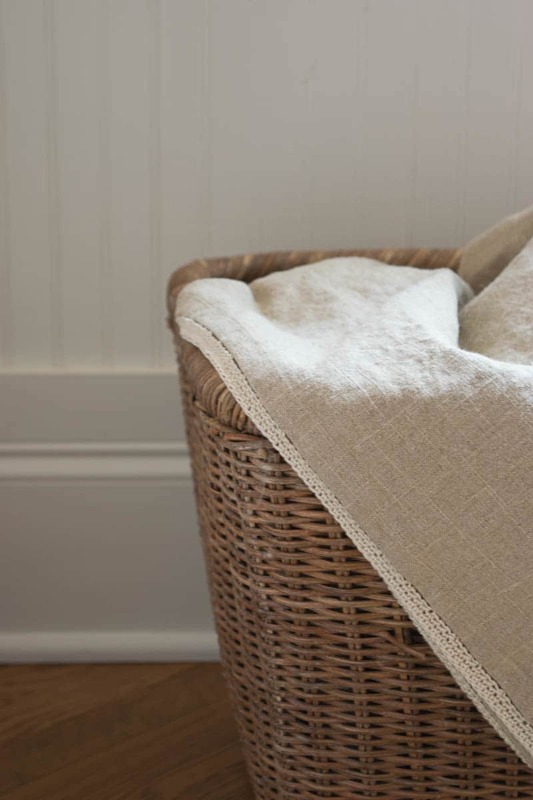 Hi Lynn, I love the idea of this linen throw, crochet part is so nicely explained. I know how to crochet but I am not that good. I’ve never been one for crochet. I always stick with my knitting needles. But, you’ve convinced me! I really really want one! This is so cute and actually it’s something that I need too. I’m always needing something to keep warm on those cool nights in the spring and summer. Plus, I’m always colder than hubby which leads to uneven blanket sharing on our bed. But, this would be so perfect! I’m pinning this for later! Lynn looking at your beautiful bed is making me want to change my bedding. Currently it’s dark, I think it’s time to lighten it up a little for Spring will be here soon. Oh Wendy, I hope you do! I think you’ll be pleased with how easy this project is…and it is so worth it. I’d love t help you in anyway once you get going on it. Hi Wendy, I encourage you to give this throw a try. I think you’ll be pleasantly surprised at how easy it is…but how great it looks when finished. And i have to tell, just spent a little time on your site and your story of your daughter hit home. My sweet girl is a freshman this year and has called home, in tears, convinced she’s not good enough. Ugh. And all I want to do is hug her. She’s coming home this weekend for spring break and I’m chomping at the bit to just take care of her. Thanks again for swinging by. This is absolutely beautiful! Linen is by far one of my favorite fabrics next to my skin and to sew with. Totally pinning! Thanks Larissa…I’m pretty much loving it right now too. It is just perfect. In fact, I’m working on a second one for the foot of my bed! Wishing you a lovely spring Monday. Thanks so much Wendi…it’s a great, versatile and just lovely fabric…perfect for beachy house for sure. It’s an easy project too. This is so pretty. It would be espeically nice as I live in Florida. I can sew but I will have to check with a friend who can crochet as I never could get the hang of it. I’ll sew and the friend can finish it. Lovely project. I Debra, this throw would be perfect in Florida. And I love how you’ll turn it into a team project. Maybe make 2 of them, you sew them both and she crochets both and then you both have one! Appreciate you coming by and leaving your kind comments. Lynn, do you buy your Linen fabric in a nation-wide store or is it just a local one to you? Is there a Brand-name to your Linen? Hi Richard…I bought my linen from Mill Outlet Village here in Wilmington. It is a chain and their other stores are in Raleigh and New Bern. I notice you’re from Charlotte…surprised that there isn’t one where you are, though I imagine you have many other options. The linen I used is 55% linen and 45% rayon and is by Mill Creek. I hope this helps! I love everything about this throw. However I always thought linen wrinkled very easily. What do you do in that regard? I wouldn’t want to be ironing it all the time. Yes, linen does wrinkle, but I really don’t mind it…it’s not crisply pressed but it’s not a hot wrinkled mess either. I guess it’s a personal preference. I’m travelling right now, but I’ll be glad to take a photo of it when I get home to let you know how it looks a year after I made it and I have never ironed it. That way you can get a sense of just how wrinkled it looks before you dive in to the project. Thanks so much for writing in and wishing you a lovely day. thank you Lynn. I appreciate your reply. I know clothing made from linen wrinkles easily and a lot. I wated to inquire.